Good Morning and welcome. Lesley has put together fun and inspirational blog hop for last-minute simple yet sweet Christmas cards or tags. My card is simple and relatively quick to reproduce. Card Recipe - I formed a 4 1/4 x 5 1/2 inch card from cardstock. I used Simon Says Stitched rectangles to create a layer of brown cardstock and the second layer of white cardstock. 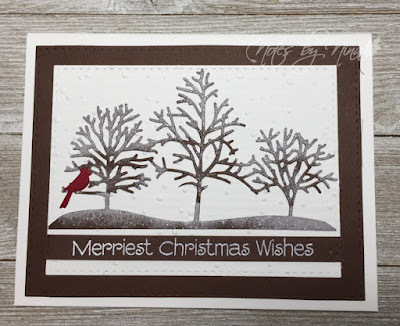 I used an embossing folder to add snowy texture to the white cardstock layer. I then die cut the trees and added some white pigment ink and sprinkled with some snowy glitter. I heat embossed the sentiment and popped it up with foam tape. I finished the card with a small red cardinal. The die cuts make this a quick and simple card that is easy to put together multiple cards at once. 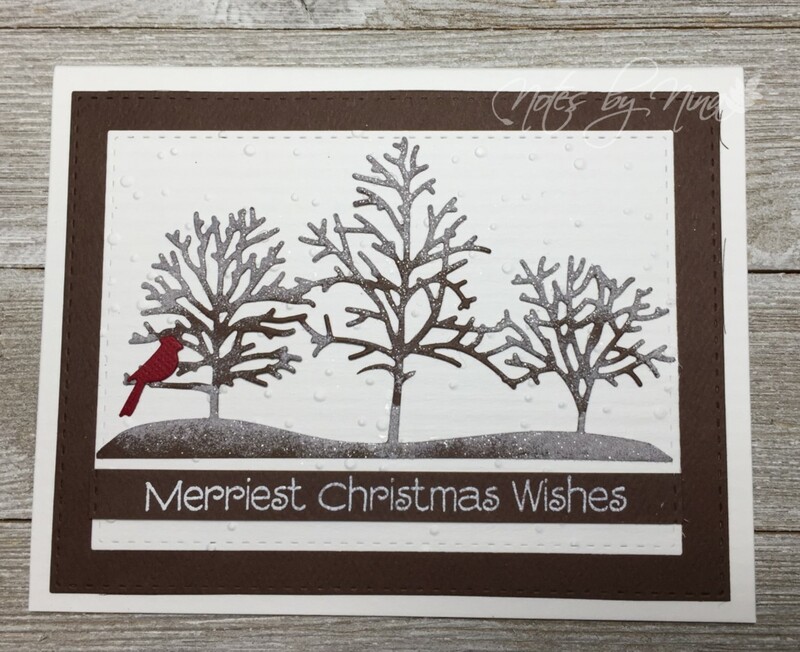 Supplies: White and brown cardstock, Simon Says - Stitched rectangles, Penny Black – In the Winter, Impression Obsession – Cardinal, Hero Arts – Jolly Holiday Wishes, embossing folder and Stampendous – Crystal Snow. If you just happened to stumble across my blog and this post be sure to head over to Lesley's blog and start at the beginning to hop along to a long list of wonderful inspiration created for the Simply Sweet Christmas Inspiration Hop. I love this Nina! That little red Cardinal is the perfect Christmas touch! This is so pretty!! I adore the cardinal on the tree-such a little but fabulous touch on this great card!! Such a soft and beautiful card! Love the snowy feel to it. So pretty! Love the red bird!!! Oh yes! Love that little cardinal too! The trees and the monochromatic design is perfect! This is such a gorgeous winter scene! Love the gorgeous winter scene you've created and how glittery it is! What a pretty colour combo with just the little pop of red! Ooo, Nina, love those snowy trees and the woodland feel of the whole card! I just love this beautiful card design especially the frosted glittery trees! I love your pretty winter scene! Beautiful card! What a beautiful card, Nina!! This is such a peaceful and serene card design..gorgeous! I really love how the red cardinal just sort of pops off the card! The card is lovely. Kudos! This is a beautiful winter scene!